This post may either bring us closer or cause some unsubscribes, although I hope it doesn’t do the latter. Because it’s a post about a salad, but it’s also a post about a very polarizing public figure. Don’t go away; let’s just sit down and talk about this for a few minutes. She’s been getting a borderline crazy amount of flak over her new cookbook, It’s All Good: Easy Recipes that Will Make You Look Good and Feel Great. At first, a few people popped up with some mean little reviews, but now it’s everywhere; and you know what? It’s gotten pretty nasty. I’m not a huge fan of that, even when I don’t particularly like someone, especially because there’s really no call for it. This is not the latest Thomas Keller cookbook masterpiece; nor does it claim in any way to be. Do I think Gwyneth is a little crazy? She sure is, but I think lots of us are a wee bit off the deep end with things we like to do; we’re just not all famous, so no one hounds us about why we’re doing a juice diet for a few days or why we tried Bikram yoga. Because hey, guess what? Those things were considered to be tremendously weird at one time, also. It is interesting to note that the journalists who have openly hated on this book seem to have a big case of only seeing what they want to see. As I said before, this book isn’t Mastering the Art of French Cooking. But neither are books from Rachel Ray or Ina Garten, and I don’t see them getting panned by everyone on the planet. There are no recipes for cassoulet in here; rather, there are recipes for how to boil and egg and how to make avocado toast (by the way, these are the easiest found in the book; many of the other recipes are just as involved as those you would find in other cookbooks.) Are we that snobby as a food culture to think every single person on this planet knows how to do those things? My sister called me a few years ago to find out how, yes, to boil an egg. She was, at the time, in her late twenties. In the past few years, she’s asked me to show her how to make simple salads, avocado ranch sauces, and so on; all easy things to do. My sister is not daft; in fact, she’s very smart, she just simply has never done those things before, and didn’t know where to start. I don’t dismiss cookbooks with super-simple recipes as pointless, because although I may know how to put together things that are easy, and maybe you do too, not everyone does. What is so awful about putting things like that between two covers? Some say that putting this book out is irresponsible and “can cause confusion” about dieting by suggesting you spend gobs of money on a specific type of honey, or egg, or corn, all the while making you believe that this diet is the only way to move forward. Maybe I give the human race more credit than is warranted, but I bet we can all figure out ways to spend less money on like products to make these recipes with. Somehow I was able to determine that buying Ghirardelli chocolate was an acceptable and affordable alternative to the Guittard or Scharffen Berger chocolate nearly every one of my critically acclaimed cookbooks proclaim I must use. Furthermore, I’m not seeing where she suggests that this is the only way to eat ever again for the rest of your life. Forgive me, but I think books for the Atkins diet or Fit For Life seem to suggest this in a much more concrete way than this book does. With, might I add (at least in the case of the Atkins diet) some pretty epic side effects if it’s done long-term. Another thing: in the current culture of “something, something, quinoa” we all live in, why do we hate a book which contains lots of whole-food-based, good-for-your-body ideas? There are a multitude of bloggers who exclusively make foods like this, and no one criticizes them. Stacy over at Every Little Thing made a salad the other day using nothing but fresh citrus, some pomegranate arils, a wee bit of cheese and some chopped nuts. I think it’s beautiful in its simplicity and freshness, and no one is raking her over the coals for it (as well they shouldn’t.) Williams Sonoma did a big push for healthy living in January with their “30 Days of Juices” collection, and I’ve had some good results using some of their recipes to create my own juices. Did I need a recipe? One could argue that I did, because I didn’t know the first thing about juicing or what tasted good together. It’s been very helpful. So is it that glossies and websites are fine promoting this, but it doesn’t make for a proper cookbook? If that’s the case, it’s too bad, because I think it’s nice to have a hardcover, more permanent reference in my library. And finally, the biggest thing critics keep missing (and I tend to think it’s on purpose); by her own words, it’s a book that’s informational, about a diet her doctor put her on, ideally done for a few weeks at a time. She says she does it a few times per year. No one bother to mention that tidbit in their critical and objective review? Interesting, because the information isn’t difficult to find; it’s in several interviews she’s done. She says that eating like that all the time is “a sacrifice that I’m not willing to make.” So this isn’t how she eats all the time, but rather how she eats when she wants to restart her body. Have any of you like, completely over-sugared yourself say, over the holidays and then gone on an all-vegetable diet, or raw diet, or cut out sugar for a few weeks, or juiced? That’s basically what this book is about, only it’s a book and not just you guessing at things. Confession time, although I hesitate to even call it that, because I know I’ve said things like this before. I bake sweet things. I make them for the blog, I make them for family gatherings, I make them all the time. Mr. Table came home one night to two cakes, three batches of cookies, and a cobbler once, and it wasn’t even Christmas. I try to keep my taste-testing to a minimum, but admittedly, it’s difficult. I feel gross every so often. I try to balance it out by eating very healthy meals, but that’s hard too, because eating healthy involves planning, prepping and time. Add freelance assignments and a two-year-old to the mix, and you get off track. I do “diets” like this regularly – not full-on juice cleanses, but menus that cut out sugar, meat, wheat, etc. because it perks me back up to my normal level of energy. I like having menu ideas for reference, because I know my way around a kitchen, but I can’t always come up with these types of recipes on my own; I need and am grateful for the help magazines and books can provide. I like eating like this because I really do feel recharged and energized; I am able to meet the demands of my day, and my sugar intake isn’t skewed. Which, in my opinion, makes the food I create for this blog better, because you’re not getting any bias from the massive sugar tolerance I’ve built up. My point: I almost didn’t write this post because I felt like maybe I didn’t want to be in the minority. It’s silly, really, because I’m an adult, and peer pressure shouldn’t matter to me (and most of the time doesn’t matter to me.) 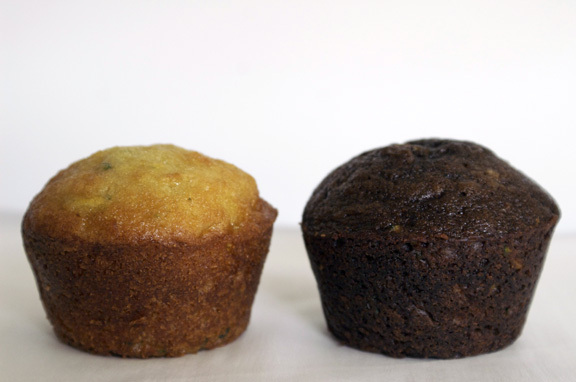 So here’s what I’m thinking: Maybe I need to not care what other food writers think. Maybe I need to just make sure for myself that I know the whole story before making a judgement call (because at first, I was pretty quick to judge). Is this book for everyone? Absolutely not. In fact, there’s no reason to own it if you’re not interested in eating this way. I may or may not get the book, but I will – like every other cookbook – be testing it out at the library and deciding for myself. But I won’t feel embarrassed about it if I do. Just saying; something to think about. One girl’s opinion. Okay, it’s safe now: on to the salad! I was all over that soapbox today. Are we good? I hope our relationship remains intact. This salad, in a way, inspired this post because I found it on GOOP: Gwyneth’s website, which I very much enjoy. Say what you will about her (and I say things too, I’m not her biggest fan), but GOOP has some pretty great stuff on there; there’s travel, food, all sorts of things. Visually and organizationally, it may be one of my favorite sites of all time. This salad is one I saw a little while back, and it looked so simple and colorful that I thought it would make a nice addition to Easter brunch this year. It all comes together with your choice of vinaigrettes: I made a very straightforward balsamic vinaigrette for it, but I liked it better with a white wine/dill vinaigrette I had made to serve with those tortellini skewers, so I’ll include the recipe for that one here. So there you go; I had so many thoughts on Gwyneth this time! I promise that won’t happen regularly. I mean, it may happen again though; who knows. Adapted from a GOOP recipe; the original version can be found here. The dill vinaigrette recipe is adapted from recipe I found on myrecipes.com and is here. whisk together vinegar, dill, mustard, garlic, sugar, and lemon juice until well-blended. With your whisk in motion, slowly drizzle in the olive oil into the mixture. Continue whisking, as briskly as possible, until the olive oil has emulsified and your dressing is homogenous. Season with sea salt and ground pepper and refrigerate for 1 hour or so to meld the flavors together. 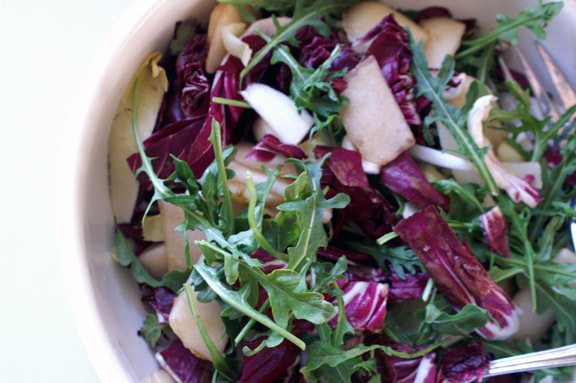 place radicchio, endive, and arugula in a large, shallow bowl and use your hands to toss together. 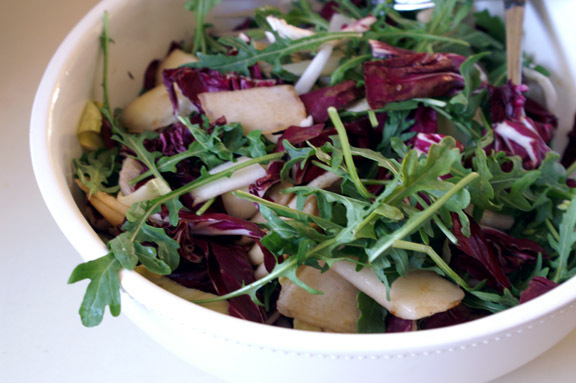 Using a vegetable peeler, peel the pear in thin slices over top your lettuces. Do the same with your Parmesan (either peel a la pear peels for visual continuity, or grate, or use a pointed, thin knife to chunk small pieces of the block and throw over top). Season with sea salt and fresh ground pepper and serve alongside the dill vinaigrette. Serves 4 for a light lunch salad and 8-10 as a side salad. Yay, you didn’t post at night! I totally hate haters. Why do people have to go and be all mean, even if the person deserves it! (in this case I don’t think she does). I do think that at times Gwyneth seems like a know-it-all. It’s good to have ‘basic’ recipes in a book. I had to google how to hardboil an egg at Easter! There need to be cookbooks for every level and everyone’s tastes. That being said, I think you should post whatever darn recipes you want to post! Chances are if you want to eat a yummy salad now and then, others do too. Love the idea of a dill dressing. I must try that soon! omg it’s like you posted so entirely fast it’s like the comment whipped right past me and i’m just now seeing it. you’re like LIGHTNING. Amen and well written! I’m not a huge Gwyneth fan, but I totally agree with you…people love to pick on people, especially celebrities, period. Thank you, Sue! I really tried not to go overboard with it, but yes; Gwyneth fan or no, just no one should be a fan, i think, of negativity and nastiness. It’s too bad, because we all fall into the trap sometimes (certainly i do) but I try my best to not be like that. Ugh, the critics. I never listen to the critics. They’re always putting down movies, books, restaurants, etc; most of which are perfectly good. I take their opinions with a grain of salt. We’re all different; it’s what makes the world go around. One decision isn’t the end-all-be-all. That’s why I try to steer clear of chatting about politics and religion. Things can get bad, quick. i probably promise to never talk about politics or religion on the blog; too volatile. and i respect everyone else’s opinion on those topics as well, same reason, but those are so personal, so it makes it tricky. I always think there’s a small element of jealousy when people bash a famous person. Sure, Gwyneth is a little out there and I definitely don’t see eye to eye with her eating philosophies, but that just means I probably shouldn’t buy the book… to each their own. I’m sure some people probably think I’m totally crazy for NOT being on a detoxing juice diet, after all. Isabelle, BIG agree! That’s always my biggest suspicion with things like this. it’s sort of like, what is it you really hate about her, Media People; the book or that she’s beautiful and has a cute husband and kids and seemingly a really great life? I don’t always get her eating philosophies either, but i have a hard time calling anyone crazy for trying to eat well or include balance and health in their lives, you know? so if i do another rant, i just need to conclude with something delicious to eat? DONE! and your salad looks beautiful; i was reorganizing my “need to comment” posts yesterday and i saw it; it will be on my salads to make list. I will be telling you that ‘officially’ as soon as i venture into the google reader. omg, here i am, changing lives and breaking down walls, every day! 😉 j/k. it IS a lot like the Aida thing we’ve talked about; maybe i’m a geek but i like to sort of explore a person before i choose to not like them, and she’s probably a good example of that, at least for me. and exactly; so “cute” how the media can be all “oh, stop the violence! stop the bullying!” and then five minutes later be plastering unflattering photos of people going “OMG IS SHE PREGNANT? SHE HAS BALLOONED! !” way to go, contradiction. i feel good about it; i was super nervous, but i have to say, i feel like everyone got what i was saying (because i wasn’t trying to be all “up with gwyneth!” about it.) just another reason i think the food community is pretty awesome. you and me both with clean recipes; seriously, summer is basically HERE. I can’t stand haters myself. Don’t know why people feel the need to be nasty or bash people for a different point of view – if you don’t like something, move on. That said, this salad looks very clean and light – the kind of food that makes me feel good instead of worrying about my waistline. I wish I could eat all the cookies, cakes, and brownies that come out of my oven but the reality is more like moderate portions of sweets mixed with lots of vegetables, oatmeal, fruit, eggs, etc. I just came off of Spring Break so I could use a salad like this right now. 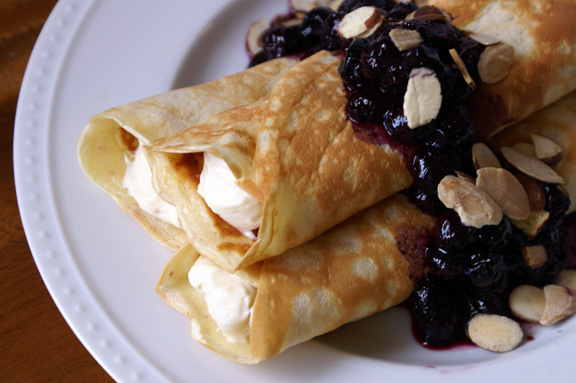 That said now…have you tried GP’s buttermilk pancake recipe? I tried it about a year ago and make it all the time for Sunday breakfasts – my family and I love it because it is just super delicate and delicious. Monica, agree! and you summarized my point; it’s not about fair Gwyneth so much as it’s about not having any time for nastiness or haters. You know, i looked that up the other day, because the wee one wanted pancakes; is it the “world famous bruce paltrow pancakes” one i see on the Goop site? I ended up making her ‘usual’ recipe, but I plan to try it next go ’round. Yes, it is her dad’s buttermilk pancakes – the one where you should let the batter sit overnight. It is incredible and on our breakfast agenda for tomorrow morning. : ) TGIF! monica, i’m trying this today; or rather i’m making the batter today after i run to the store, adding a little something special to them (just to try something i’ve been meaning to try) and then cooking them tomorrow. Did you make them? how were they?? And sentiments fully supported by me! There’s no need for people to put others down while voicing their opinion. Nor is there any need for ignorance or non-objective reporting – it’s something I have a hard time hearing (ahem, politics!). That wee factoid that GP doesn’t eat like this all the time seems awfully crucial if you’re going to write a criticism of her book…but, hey, what do I know!? I know this salad looks delicious and that sometimes it’s awesome to hit that restart button on ourselves, whether its through food or mentally chilling, whatever. And I know that I love dill! yay to both!!! agree; why bother ripping someone apart, especially if your information is faulty/biased/wrong? Certainly this book is not for everyone – i haven’t even decided if it’s for me – but i’m not about to go pop a vein hating on something i know nothing about. I’m with you on politics; same reason. It’s just a lot of energy (and bad energy, at that) to put into something, i think. i’m happy you like the salad! you know, i must have really loved it because i found myself gobbling up the last bits of it the next day for lunch (bonus points for me not shaving pear into all of it or topping it with dressing; it stayed like it should!) if you love dill, make this dressing to throw on whatever this spring and summer; it would be pretty awesome on a salad with asparagus and peas, also. I don’t really know a lot about Gwyneth Paltrow, so this whole outrage has me totally confused. She dated Brad Pitt once, and she named her children Moses and Apple, so I guess she’s made some suspect choices. That’s literally all I know about her. But she, like everyone else on the planet, is entitled to her opinions. What’s with all the haters?! Most of these arguments are really incendiary, too. It’s all silly, I think. Bitter greens scare me. I had a bad experience with radicchio once. I love how you add pears and a dill! vinaigrette! with dijon! to temper their scariness. that’s a decent amount to know about her (and bonus points because i think almost no one remembers she dated brad pitt). i think she’s done things publicly that are different, like macrobiotic diets, and cupping (google it) and other things like that, so people write her off as a flake. i think, honestly, lots of the hate comes from her being a pretty, successful woman with cute kids and probably a sick awesome husband and life; typically where hate lives, a fair amount of jealousy lives also, at least in my opinion. you’re right; it’s silly no matter what the reason. especially b/c if you think she’s so ridiculous (journalists), why waste five minutes of your time on her? i can see how bitter greens could be problematic; i’ve definitely had like, feelings of doubt in some salads which include them. i will say with this one that both the sweetness and juice of the pears combined with the sweetness of the vinaigrette go along way to balance out the bitter here? It’s a little like the fig and prosciutto salad i did back in the summer; it’s not so strong when surrounded by sweet things. Okay so what the f are pomegranate arils? They sound like the most highfalutin salad ingredient ever:) Not hating though, because this post has taught me that hate is bad. And that diets are maybe good. And that eating five desserts in one day (“taste testing”) is also definitely good. Mmmm, five desserts. confession: i didn’t know, really, what pomegranate arils were. or rather, i DID know (b/c i guess “arils” are the proper name of the juicy seeds we knock out of there and love so much) but i didn’t know they were called that until Stacy called them that in her post. She’s smarter, clearly, than i am about these sorts of things. I’m in total agreement with you about being annoyed at all the hatred about this book. I think the most ridiculous was a post that claimed it would cost $300/day to make recipes from the book, and then proceeded to price out a day’s worth of recipes using the full price of every single item (i.e. $10 for a container of sea salt or the price of an entire can of spray oil, neither of which are going to be used up in a single day! The salt was even charged twice, one container for breakfast and a separate one for lunch!!) My view is…if you don’t want to cook out of this cookbook, just…maybe don’t buy it? Wouldn’t that be good enough? I know I have NO room on my cookbook shelf and so I’m picky about what I purchase, but that doesn’t mean I need to go out of my way to spew hatred on every purchase I choose not to make! Anyway, rant over! Love this salad – looks super delicious! I really love pears in salad…somehow I never think to do it (I tend toward apple), but a good reminder that I should use them more! Sara, that’s exactly the article i was referencing when i mentioned that i’m sure we could all figure out how to sub in less expensive items for what she uses. I find it difficult to believe on several levels; one for what you just mentioned in terms of ingredient usage (i use up a box of kosher salt once a YEAR, probably) and two for the contradiction. If you say she only makes avocado toast, in what world does this cost $300??? Ludicrous. Agree: not interested, or think you won’t use it? By all means, leave it off your list of things to get, but don’t have a heart attack ripping it to shreds. thanks! I’m a huge fan of pears in salad too; such a nice sweetness, right? And they sort of make their own little contribution to the dressing with their juiciness, which i always think is a plus. Well said, woman. Would I name my kid Mango? Nope. But I admire anyone who can put together a cookbook – even if it’s not my favourite type of noshing. I don’t envy famous people – not a bit. I can’t imagine hearing/reading so many horrible things about myself every day – it’s tough enough out there. Look at poor Jennifer Aniston – rich, successful, independent – and yet the media constantly questions whether she can truly be happy without a baby. As if a woman can’t possibly be satisfied without a child – not even if she’s immensely successful in her career. GAH!!! …and yet Mango Beaucoup has such a nice ring to it. i admire it too; and certainly anyone also who continues to work and do things when obviously they don’t have to (and she kinda seems to work pretty hard). I agree; i’ve always said that although i would love to not have to ever worry about money, i wouldn’t want to be famous. Or rather, i think i’d like to be one of those famous people who is an author or something, thereby keeping me out of the gossip mags. the jennifer aniston thing is ridiculous; especially in this day and age, who wouldn’t think you could be perfectly happy without a child? no one ever asks that of them men, which i think is odd, b/c they typically have some role (approximately half) in children coming into being. just saying, no one is asking if George Clooney feels unfulfilled. i would totally make you nice salads. every single day. I finally picked this book up at the library yesterday, after having it on hold FOREVER, and for the life of me I just can’t figure out why people have such a problem with this book. Yes, there are a few pricy ingredients, but most of them can be substituted out. And most of the recipes in this book do not even use them. It’s not as if Gwyneth says, “whatever you do, do NOT substitute regular honey for the raw or manuka honey”. Anyone who has half a brain, and doesn’t want to follow a super-strict diet plan, would know that you can use regular honey instead. I would, because it’s something I always have in the house (and, yes, it’s cheaper). What I saw when I went through this book? 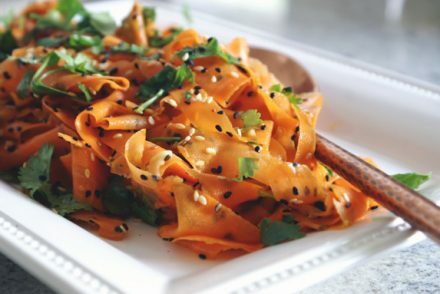 A whole bunch of yummy sounding/looking healthy recipes, all of which seem fairly easy to put together, and most of which don’t use crazy-exotic ingredients. In fact, I’m, going to try out some recipes soon. And if they are good, I may even add this book to my wish list. Because despite all the baking I do, the meals in this house are healthy (at least they are about 90% of the time). One can’t live on crap alone. And as for the recipe for a hard-boiled egg? Well, let me just say how thankful I am for the tutorial on how to make hard boiled eggs in the Everyday Food: Great Food Fast cookbook. Because before I got that cookbook I’d boil the heck out of the eggs, until they were way overcooked and the outside of the yolk was dark green (not very appetizing!). So many people these days lack the most basic of cooking skills. And maybe if they knew how easy it is to make a simple meal out of simple inexpensive healthy ingredients (hard boiled eggs, baked sweet potatoes, avocado toast, etc), they wouldn’t need to rely on processed crap and fast food, and there wouldn’t be so many health problems in this country. this book finally became available at the library right before vacation, and i lugged it along with me. i spent several days reading it page by page, and i would eat every single recipe: like no joke, easily it all sounded good. i’ve been cooking from it for the past week just to sort of get used to it, and it’s been fantastic. like i feel good and unweighed down and not at all like i’m “trying” to eat healthy or in any way sacrificing good things. so far everything i’ve tried has been hands-down delicious. period. Oh, and now that I know you love the recipes you’ve made from it, I can’t wait to give some of them a try! i’m sitting here eating one of the recipes for dinner; no joke. it’s page 33, the “quite savory” recipe for what to do with leftover quinoa, minus the garlic (i think it’s a little strong) and with red quinoa versus normal white. i’ve been eating the “a bit sweet” version on the same page for breakfast for a week now. also, if you like parsley, try the creamy parsley dressing (i just left out the xylitol because i don’t have it yet) on page 61: it’s great with the power salad it’s paired with, but it’s great with basically every other salad too, and exceptional for summer. really fresh and light. Now I’m really curious, and I can’t wait for the reveal!! As soon as I saw the “quite savory” quinoa recipe last night I thought that I would probably love that. So now I definitely need to try it! The sweet one looks good, too. And I’m sure we’d all love the parsley dressing. Seriously, what is the problem people have with this book??? I just don’t get it.